My sewing challenge for this year is to conquer curves. I have only ever tried sewing a wavy line once (when I was making a sampler quilt) and it was such a disaster that it put me off ever trying again. 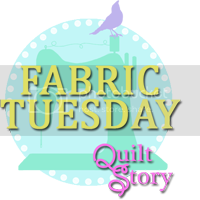 But I can see how being confident in sewing curves opens up numerous possibilities for quilt designs, as well as maybe tackling making garments. 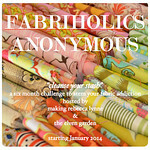 I was thrilled therefore when Rachel (who blogs at Stitched in Color) decided to offer her curves class again this year. The focus for the first week has been on basic curves, and the projects have been quick and enjoyable to make. 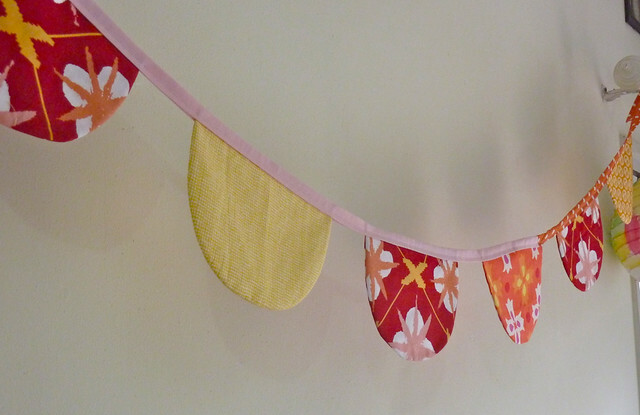 The scalloped bunting resulted in much laughter in my household as my boys declared that it looked like a row of bras, and so it had to be quickly taken down! 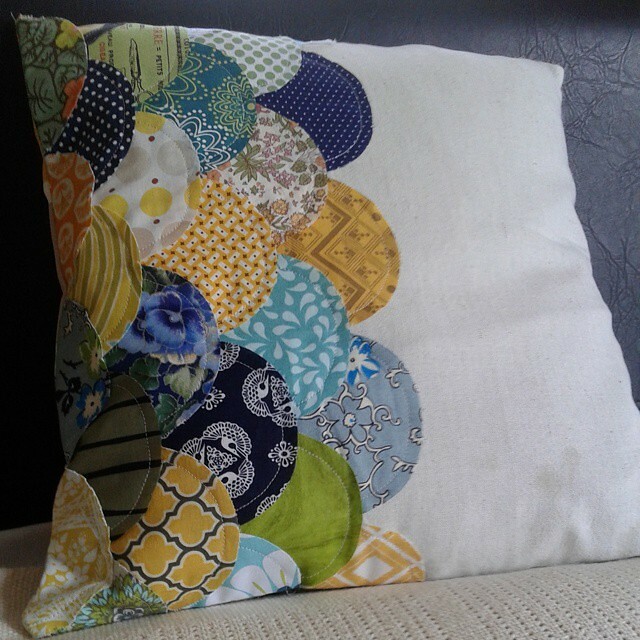 The clamshell pillow took a little longer to make (well cutting out the clamshells did anyway! ), but the sewing was again straightforward and I love the result. I used some linen as the foundation fabric, selected a whole lot of scraps for the clamshells, and on the back I used a piece of Ikea Home Decor fabric which I had been given a while ago. 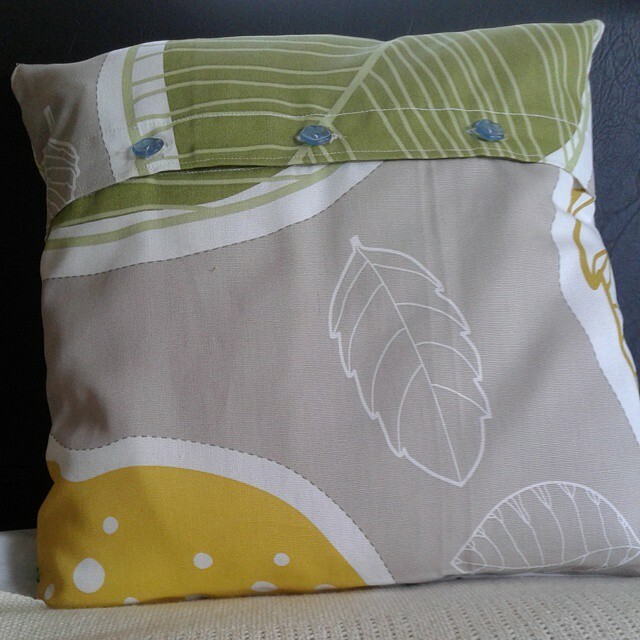 It works really well for a pillow like this as it gives a little more structure. I also made my first ever button-holes which were super easy on my new Juki! I can't wait for the second week of this class - bring on the improvised curves! I am linking up these projects with a Blog Hop which I am proud to be a part of this year: Ho, ho, ho and on we Sew! It is hosted by Fiona and the idea is that we don't leave our Christmas making until December, but instead make gifts throughout the year, so that (hopefully) things will be a little less stressful at the end! 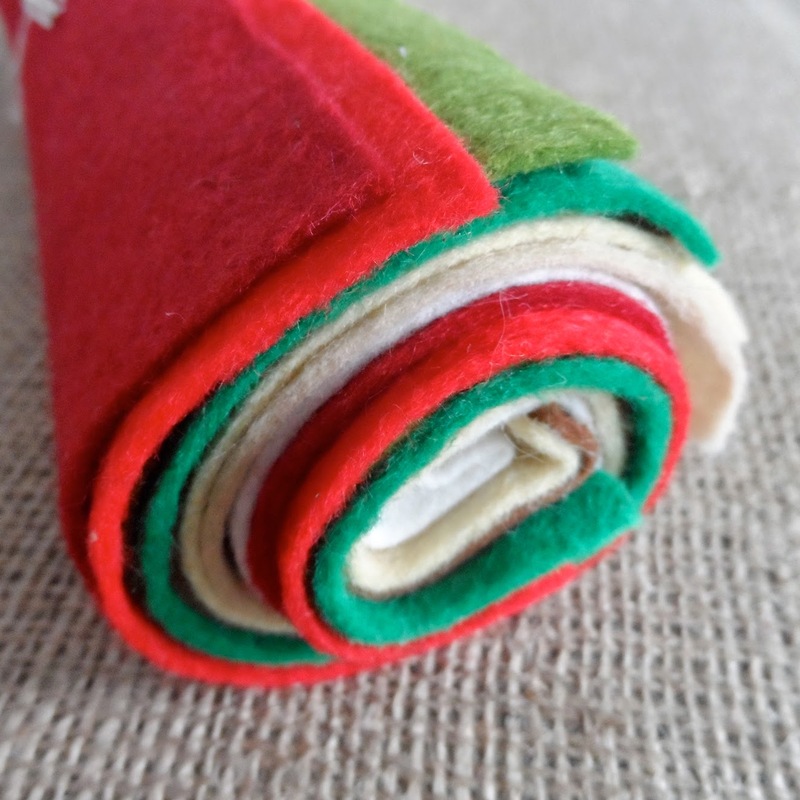 There is a linky party each month (hosted by different bloggers), so head on over to Fiona's, check out her tutorial for a cute Christmas cushion and join in with the chance to win this gorgeous felt bundle. That is such a great idea not to wait until December. It's such a busy time of year to pile on the gift making too that it can be even crazier busy than anyone wants. Get practise and creating Christmas gifts - woohoo! Cute cushion. My daughters and I volunteer for the scalloped bunting! It's so pretty. Bras?! The cushion is lovely too. I'm working on my Ho, ho, ho and on we Sew! project. Sewing for next Christmas is such a good idea. Had to laugh about the bunting! I'm hoping to do something Halloweeny with it for this October! Love your cushion! Good on you for tackling curves! Your clamshell pillow is lovely. Love the Clamshell pillow -- a friend has just started a king size clamshell quilt -- looks overwhelming to me but she's enjoying it! Aren't buttonholes easy once you have tried them, you will be having button closures on everything now! Love your pillow! Buttonholes - wow, that may be the next thing I need to learn! My quilty friends and I are going on retreat in April and plan to use the time to conquer curves too. We are looking for a project that we can more or less finish in a weekend so I am looking forward to seeing your progress. The clamshell cushion is so pretty. I don't think that the bunting looks like bras but I could that once that association was made you would have to take the bunting down :) The clamshell pillow looks great too! I'm co-hosting in October so I'm having fun reading everyone's contributions to get ideas for my own post - I have an idea simmering, but I've changed my mind now about 4 or 5 times, lol! Your clamshell cushion is lovely, Deborah. Only boys would think of bras when looking at your bunting. Well done on mastering smooth curves. Stopping by from Ho, Ho, Ho. Gifting your bunting to a friend without boys made me smile :) Congrats on getting ahead for Christmas! I've seeing you progress conquering sewing curbs on Instagram and you are doing amazing. I love all the projects you are making. The clamshell pillow is my favorite. I love your boys' sense of humour, no doubt I may have met with a similar response in my house too! Looks like you are well on the way to mastering curves. Your boys comment made me laugh!! I bet you're having fun with the curves class, I love the clam pillow. Good on you for starting your Christmas sewing so early. Bra bunting is so fun! :) Thank you for sharing that remark! Only a teenaged boy would see bras in that! I love the cushion. I find it funny how sewers who didn't start with dressmaking find curves, buttonholes and zippers daunting. My sewing demon is quilt sandwiching.